FSSI is a unique Contract Research Organization (CRO) specializing in sample formatting services. FSSI is equipped with a state-of-the art, climate controlled, liquid handling facility. The biggest reason – that’s all we do. FSSI can accurately solvate more than 50,000 samples per week, formatting stock libraries or newly purchased samples into industry standard plates. 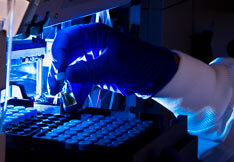 FSSI may also transfer existing compound collections from vials to 96, 384 or 1536 well plates. We follow rigorously validated SOPs, yet remain flexible to meet your custom requirements. FSSI has a highly trained staff with more than 100 years of experience in the pharmaceutical industry. Sample Solvating – FSSI will solvate existing samples in DMSO or other solvent. Transfer – FSSI will transfer existing compound collections from vials to 96, 384 or 1536 well formats. Plate Creation, Replication & Dotting – FSSI will create 96, 384 or 1536 well plates for screening assays. Existing plates can easily be replicated or dotted (i.e. 0.5 µl, 5 µl, etc) as needed. Condensing – FSSI will compress 96 well plates to 384 well plates or 384 well plates to 1536 well plates. Plate Cherry-Picking – Existing plates can be cherry-picked for hit-to-lead confirmation. Automated Serial Dilution – FSSI will serial dilute compounds for concentration response studies in any desired configuration. Sample Storage – FSSI routinely stores sample for customers in our –20º C walk-in freezers in segregated areas on specially designated shelves.